A screenshot of the final effect, taking seconds to render on a single machine. This was originally achieved by use of a cloud tank, where coloured dyes and other chemicals were immersed in a big glass tank of water, lit from various directions, and then photographed. This effect was used in a number of other 70s/80s films, including Indiana Jones. You can read all about it here, and there are lots of videos like this one that show you how to create your own. An example of a cloud tank. At that time, you could not increase the detail beyond a certain limit, and the rendering time was quite cumbersome on a single machine (remember in 2009 public distributed computing like Amazon Web Services were still in their infancy). I revisited the problem a number of years later in 2014. Blender had developed its Cycles system to include volume rendering, and with their nodes editor I was able to create more effects. This time I used a more straightforward cube shape and then used 3D noise and colour ramps to control the effects. I also started embedding light sources inside the cube to suggest stars which also produced some better effects. I still found drawbacks to this technique; I had a lot more power to control the effect, but rendering times were still extremely high especially on a single machine. I was experiencing times of between 1 and 6 hours for a half decent single frame render. I therefore did one further experiment with this technique using an open source tool called Brenda and ran the process across multiple machines using Amazon Web Services. This way I could split the work up across multiple machines running simultaneously to reduce the time to render. I was still very impatient; Therefore I developed a system that can produce very effective results in a matter of seconds, at the sacrifice of being totally navigable – however you could simulate this using various techniques that splits the clouds up onto multiple 3D planes. The effect was a development of a photoshop tutorial I saw online. This tutorial used more traditional painting techniques to great effect, and the key was how the artist overlaid different painted clouds over each others using the colour dodge filter. The most time consuming part was producing the clouds – so I cut that time down by using a noise texture. 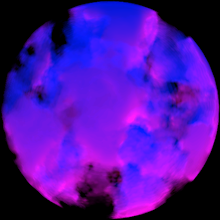 I used Cycles in Blender and the node editor to overlay different noise-generated cloud effects on top of each other using the Screen filter, adding this to the world background. Because I wasn’t using volumetric rendering any more, I could produce good effects in near-realtime on a single workstation.